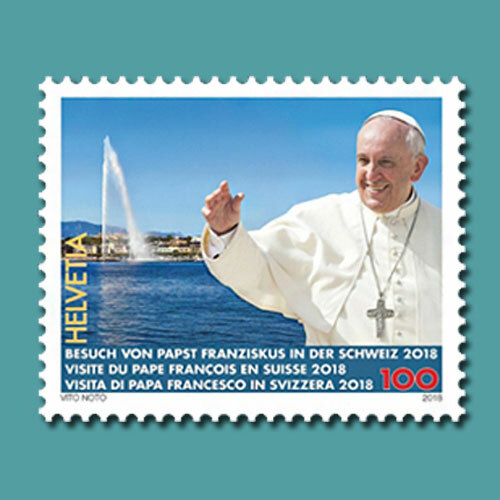 Pope Francis had recently visited Switzerland and a special stamp was released on 21st June by Swiss Post to commemorate this event. The official announcement about the stamp release was made on 20th June, a day before the pope’s one-day visit to Geneva. The day also marked the 70th anniversary of the World Council of Churches. The 1-franc stamp features the pope waving with Geneva’s famous landmark Jet d’Eau fountain in the background. The Jet d'Eau is situated where Lake Geneva empties into the Rhone. Five hundred litres of water per second is pumped 140 metres high by two 500 kW pumps. Some visitors also get drenched when there is a small change in the wind direction. The first Jet d'Eau was set up in 1886 at the Usine de la Coulouvrenière as a safety valve for a hydraulic power network and could reach a height of about 30 metres. It was shifted to the current location in 1891 to celebrate the Federal Gymnastics Festival and the 600th anniversary of the Swiss Confederation. Its maximum height was about 90 metres. The present Jet d'Eau was installed in 1951 in a partially submerged pumping station to pump lake water instead of city water. The fountain celebrated its 125th anniversary in August 2016.